I had earlier started a thread on US military tech and weapons because of the huge presence the US has and its leadership in producing new classes of weapons that everyone is told will be "the future of war" - even though the weapons may only be "the future of weapons exports". What we miss, because it is all in Russian is what the Russian are doing. India has a long history of using Russian weapons and weapons systems. And yet we have no thread for following what the Russians are doing. The Russians have a different philosophy from the west. I hope to remedy that with this thread. Kh-38M missile, which enters production this year, by adding a module with a long folding wing and extendable empennage. role fighter on static display. (1,146lb) with a 250kg (551lb) warhead; the Grom-2 has an additional 130kg (287lb) warhead instead of the rocket motor. the version without the terminal seeker. The Grom-1’s speed is probably slightly lower than the Kh-38M’s Mach 2.2. Both Grom missiles on display had pointed, dielectric nose radomes, suggesting they house an active or passive radar seeker. The TMC Raduga Kh-59MK2 cruise missile, an equivalent to the MBDA Storm Shadow, was shown as the manufacturer searches for a potential foreign investor. The missile is 4.2m (13.8ft) in length, 400mm (15.7in) wide and 400mm (15.7in) tall, and its deployable wing has a 2.45m (8ft) span The 770kg (1,698lb) missile has a 1,000km/h (621mph) speed at its 50-300m (164-984ft) cruise altitude and is intended to destroy small strengthened targets. It uses the Kh-555 strategic cruise missile’s guidance system, and features a gimbal-less inertial navigation with GPS/GLONASS correction on the cruise path and electro-optical digital scene matching area correlation (DSMAC). Its accuracy is 3-5m (10-16ft). Mach 1.5, the missile’s range is 245km (152 miles) or 76km (47 miles) at low altitude. Its maximum speed is 4,200km/h (2,610mph). ArmenT wrote: This documentary is from the early 2000s, but has some nice details about the Typhoon (Akula) class subs. The sub featured in this programme is the Severstal (TK-20). The documentary is about 55 minutes long, so grab a nice drink and watch. Brilliant video Shiv, and completely supports your point about how warhead size does matter. "The Ubiquitous Kilo",was the title of a Janes' feature 15 years ago,which remarked how the sub was still doing well internationally and its attributes. This "80s tech sub is still being sold around the world,in its latest 636.3 avatar,a much improved version of the original.The subs are extremely quiet,easy tomoperate and very cheap.Vietnam is the latest nation to operate Kilos,with 6 on order,the last 2 expected next year. Their 6 subs cost just $300M a sub.half the price of a Scorpene or U-Boat. When asked about these concerns following an address to the U.S.-Indonesia Society (USINDO) earlier this month, Indonesia’s Speaker of the House of Representatives Setya Novanto told The Diplomat that officials were in the process of ensuring that “priority purchases” – including submarines, helicopters and planes – would not be affected. Zainuddin seemed to echo this sentiment, noting that the purchase plan for submarines was still on the table despite the budget cuts and was awaiting further discussion with the Defense Ministry. Indonesia currently has only two German-built Type-209 submarines, which is woefully inadequate for the world’s largest archipelagic state. It is also a far cry from the 1960s and 1970s, when Jakarta operated one of the most powerful submarine forces in the Asia-Pacific, with 12 Whiskey-class submarines purchased from the Soviet Union. Those submarines were gradually decommissioned, the last in 1990. If successfully procured, the two Russian submarines, in addition to three South Korean submarines ordered back in 2012 that are expected to arrive around April 2017, would give Indonesia a total of seven submarines. But with the two Type-209s expected to be decommissioned by 2020, Indonesia would still be far short of the 12 submarines that Indonesian defense officials – including former navy chief Admiral Marsetio – have said that the country needs to police its waters, as Zainuddin himself reiterated. But that would still constitute an advance for Jakarta in Southeast Asia’s ongoing submarine race amid concerns about its capabilities (See: “Between Aspirations and Reality: Indonesian Foreign Policy After the 2014 Elections”). Within the subregion, Malaysia, Singapore and Vietnam already have submarines, while Thailand and the Philippines are eyeing the capability as well as part of their broader military modernization ambitions (See: “Is China’s New Submarine Deal with Thailand Now in Peril?”). That being said, specifics still remain unclear. Zainuddin reportedly said that Indonesia had yet to decide which type would be purchased. He also declined to provide further information on how the purchase would be financed in the wake of the economic slowdown, which is an important consideration. Russian media reports also noted that no date or deadline was specified for the signing of a potential contract. The total weight of KAB-500 is 520 kg , 300 kg is warhead and 100 kg is HE. Must be the bison to drop it that accurately they have some sort of computer aided weapons delivery , Eons back I used to used read Jags has the best Computer Aided Dumb bomb delivery system remember reading even got better off the F-16A in NATO exercise. Austin wrote: The total weight of KAB-500 is 520 kg , 300 kg is warhead and 100 kg is HE. Austin that warhead would be the penetrator warhead for hardened bunkers - with the extra weight being some heavy, hard casing to aid penetration before the blast. 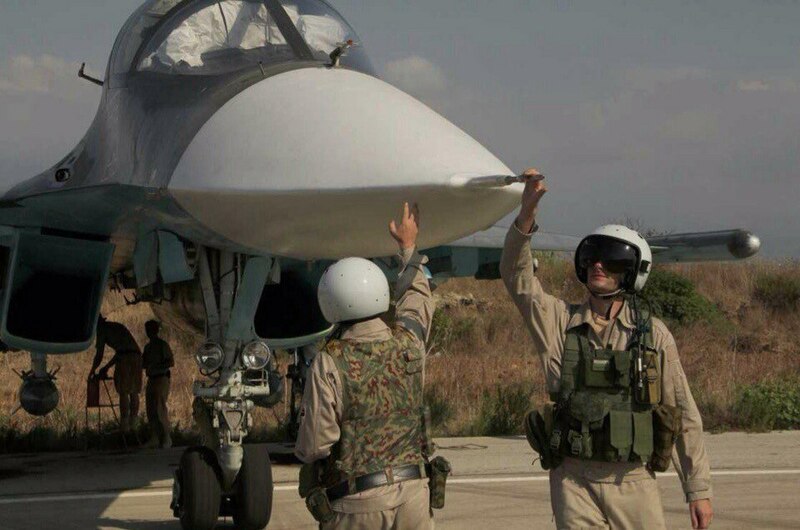 I think the MiG 21 version was the TV guided one that could be locked on to a visual image. But of course that also means that smoke/dust etc would cause problems. 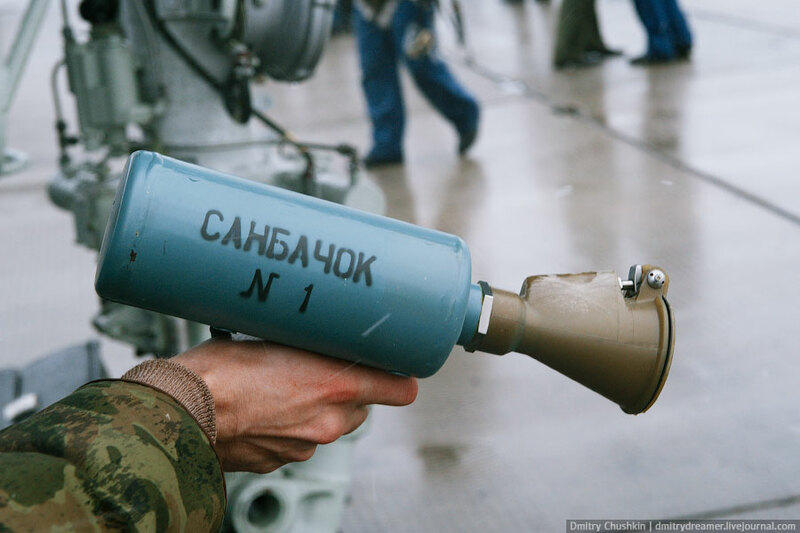 The KAB-500Kr series are Electro-Optical guided bombs. The seeker employs a gimballed daylight television imaging sensor under a wide angle glass dome. 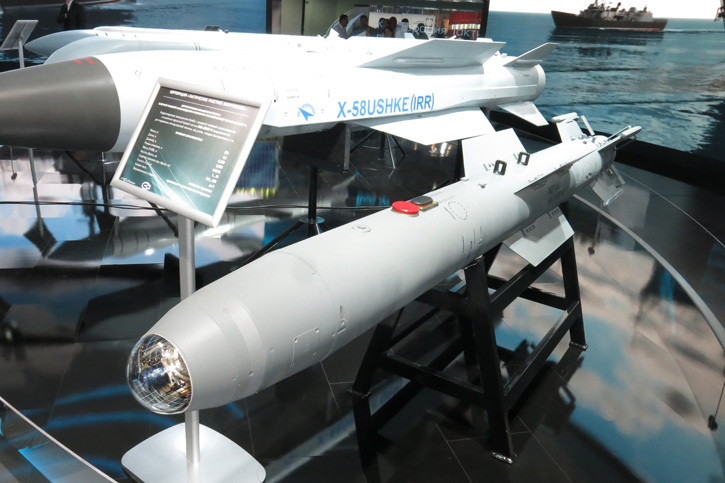 Unlike the earlier US GBU-8 HOBOS and AGM-65 Maverick which employed contrast lock technology, the -Kr series guidance system employs Scene Matching Area Correlation technology more akin to the US Navy DAMASK seeker or Tomahawk DSMAC. This results in the ability to attack low contrast targets by exploiting the contrast of nearby terrain features or objects. IOC was achieved in 1984. The cited CEP is 4 to 7 metres which is consistent with this style of seeker and the P-nav control loop technology involved. The Krym series Electro-Optical seeker is built by OAO Impuls. It is limited to daylight operation. The 10 kg SU-601 guidance and control module is built by Tambovskii Elektropribor and comprises a BU-56 control unit and PG-9-2 gas generator. KAB-500Kr-Pr-E - Penetrating bunker buster with subclaibre warhead. KAB-500Kr-F-E - Blast fragmentation warhead equivalent to M118. KAB-500Kr-OD-E - thermobaric warhead / FAE. Another new guided weapon displayed by the Tactical Missiles Corporation was the 256 kg guided bomb. The weapon uses a GLONASS/SAL guidance kit enabling it to hit targets with an accuracy of less than five meters. The bomb uses three-mode fusing enabling impact, delay (penetration) or air-burst effects. The guided weapon comes at a length of 3.2 meters and diameter of 255mm, with height of tails and stabilizers minimized by using four twin-blade rudders, providing roll and pitch for the weapon guidance, while maintaining the width and height compatible with internal carriage. Same link/source has it that Egypt will but 50 KA-52 Alligators for the Mistrals. Those who were at the very first Air Show in BLR will remember the Alligator and MI-28 first displayed abroad at the show. Philip wrote: Same link/source has it that Egypt will but 50 KA-52 Alligators for the Mistrals. Those who were at the very first Air Show in BLR will remember the Alligator and MI-28 first displayed abroad at the show. Shiv,good on you! Was it really 19 years ago? How time has flown.The beast does look like a gator with its snout,doesn't it? Nice Video and indeed 20 years have passed , Since the first AI , Cant believe ! The single seater Ka-50 did not go into production beyond single digit iirc and replace by the twin seater 52 , they found 50 to be too complex to be handled by single pilot on combat mission. No suction. Just a piss pot like people use in hospitals except it has a lid. Note how SDRE the entire process is. Robust design, hand assembled. Su-30SM (MKI derived russian flanker) ... no g-suits here either. Mijjiles being fired at targets in syria. piss pot beats adult diapers. all of 500 tons. And they did it from the Caspian Sea! Deploying the Moskva in the med was clearly a distraction. Philip saar must sleep a satisfied man today. Which missile on that small ship can strike at 1500 KM - The club series or the older SS-N-27. When i saw the missiles i was like, which ones are these. found no info on media. The 3M-14T does have a range of 2500Km. do we have it? Seems like a PR exercise - why would you launch a cruise missile barrage from a 1000 km away, when you have 30 fighters situated just a few minutes flying time away. Its not like ISIS has any real air defences to worry about. Maybe they see its as an opportunity to boost morale and self-esteem of the Caspian flotilla, which is basically patrolling a big lake that also happens to borders Iran and a few CIS states. Daaaamn! That little ship is supposed to carry teeny sizzlers - which in turn are supposed to have a range of wonlee 300km; now we see them crossing 1000km! No wonder even small sausages weigh so much when they are made by the big bear. Should put an end to the often pondered question, how is it that a missile as small as the ASMP has a range that matches the Brahmos...the above makes it clear, it doesn't. IIRC Pillai (or was it VKS) had casually mentioned a 600km range on the Bmos, absolute monster, no wonder the services are ordering it in such a hurry. How do they reduce the range on the export version of these missiles, by decreasing the propellant load, changing the electronics, or messing up with guidance software? For a Missile like Brahmos or Klub is there a chance that we can go around these and achieve the original range of 1000-1500 Miles. The Kalibr thingy has a range of around 2500 KM. That is way more range than what the Russians are using at right now. The SS-N-27 is rumored to have 3000 miles. WOW. They might as well have missiles on the Russian border and salvo fire them. bhavani wrote: How do they reduce the range on the export version of these missiles, by decreasing the propellant load, changing the electronics, or messing up with guidance software? Same as Brahmos , Software Lock , if you heard Dr Pillai comment at seminar at AI , he mentioned if Brahmos cross the range limit it would self destruct. BRAHMOS is in Mach 3 regime , those cruise missiles that the Ruskis fired are sub sonic , get mach numbers during terminal phase.